Hey! What Are You Talking About? Sometimes what YOU are asking is not what I am hearing. Let's be clear. TAR Inc. Video Blog Introduction! 1st Edition of our video blogs. Feel free to ask any question you'd like us to respond to via vlog! White Stains on My New Seal Coated Asphalt! Imagine pulling into a Wal-Mart parking lot and there is no striping. The result would be utter chaos. Cars would be parking in all different directions. People would be driving every which way. Car crashes caused by drivers choosing their own paths and not cooperating with other drivers. You would even see pedestrians strewn along the sidewalk after being hit crossing the parking lot no one would stop to let the cross. Anger would build, people would be frustrated and yes even parking lot rage would ensue. What keeps us from this unraveling of civilization? What keeps us calm and civil? What gives everyone the same rules and guidelines to live by and still get along? Yes, it’s the 4” wide yellow stripe that keeps everyone moving in the right direction. 70 Degrees, the Perfect Temperature to do Asphalt Sealcoating. Well, that will account for maybe 5 days a year. So when is the best time to do sealcoating? 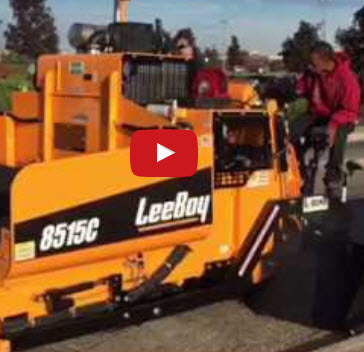 What is the most perfect time to sealcoat any asphalt surface? Getting to the Asphalt Promise Land. What do I do first? STOP! You know it’s there. You see it every day when you come into work. You even walk around the crater to get to your front door. It’s your parking lot, and you’ve been ignoring it every day hoping it will go away. I call it “Asphalt Denial”. Asphalt Sealing, Suntan Lotion for Blacktop. Feel that Sun? The heat baking your skin. Your first instincts are to put on sun screen to prevent the sun’s UV rays from damaging your body. Those same UV rays damages your asphalt as well. “Asphalt 101” Is Asphalt All the Same? The short answer is no. There are different types of asphalt for different purposes and applications. The “mix designs” of asphalt vary from state to state. Each state department of transportation has a standardized specification for different grades of asphalt material. “Surface” asphalt mix from Ohio will be different from “surface” asphalt from Michigan. What is common is that all asphalt “mix designs” fall into three categories: base asphalt, intermediate asphalt and surface asphalt. Don’t Fill Potholes. They get better by themselves. Go ahead ignore that little hole in your parking lot. It’s small and I bet it will fill up with dirt and stuff and fix itself. Hey wait! That hole is huge. It was just a tiny thing yesterday. When did that happen? Maybe you can throw a little gravel in it to take care of it. Whaaat? It’s back! And it’s bigger? Go to the hardware store and get a bag of cold patch. $50, for that little bag? I guess you’ll need two. This should take care of it. Noooooo! You patched that hole! It should last forever. The pothole insanity, when will it stop? 20 Years, Thankful to be still fixing those potholes. Today, April 1, marks TAR, Inc.’s 20th anniversary. When I started the business, I thought “no matter what happens in the world there will always be potholes.” Today it’s proven to be very true. Even through recessions, oil crises', and wars, those potholes still needed to be fixed. TAR, Inc. has expanded its services to include all asphalt maintenance including sealcoating, striping, asphalt paving and repair. Through the years of change and growth, there are many things I’m thankful for.